The time has come to wish all of you who celebrate a very Merry Christmas. Longtime readers know that one of my favorite aspects of the holidays is setting my Christmas table. This year I wanted to stray from the traditional color scheme with something seasonal and festive but a little different. 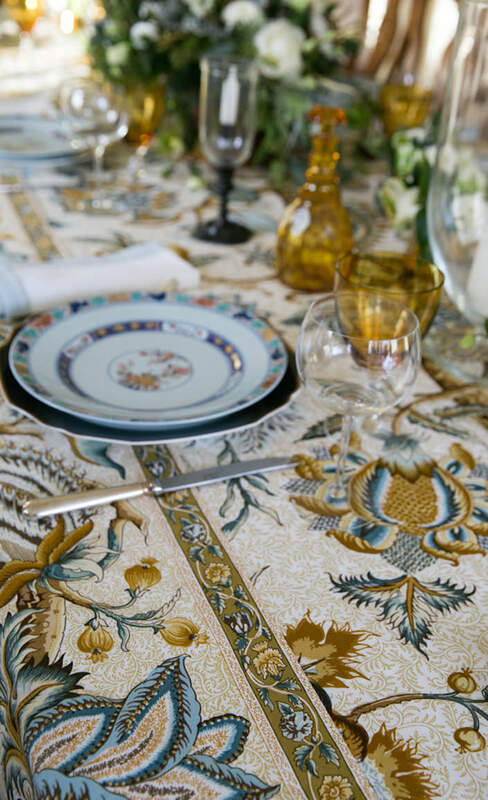 I adore the Pierre Frey Braquenié fabrics with their combination of historic significance and French elegance and have long loved the classic Le Grand Corail. An 18th century tree of life pattern on a vermiculé background, it has movement and detail in beautiful colorways that feel particularly relevant today. I have quite a long dining room table and it is often difficult to find interesting cloths that fit so an obvious option is to have something made. 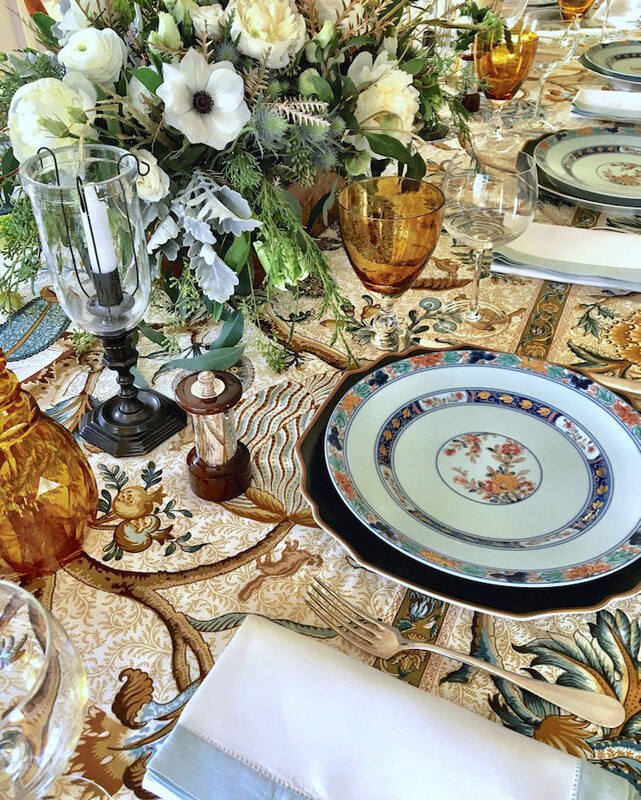 I desperately wanted to use the blue muliticolored version of Le Grand Corail as it is a wonderful complement to my celadon based Limoges patterns. The challenge was that, originally made on old looms, the fabric has a width of only 31.5 inches. Happily, friend and colleague Kim Huebner, who effortlessly wears many hats in the Pierre Frey NYC showroom (marketing, PR and showroom manager), came up with a brilliant solution. A coordinating fabric. with it’s two striped pattern, could be divided to serve as borders on either side. Not only did it solve the width issue but it made for a more finished and interesting tablecloth. And the blue and gold colors offered the opportunity to bring in many of my favorite amber and gold accessories. I always try to learn from the many accomplished designers I cover here and one takeaway has been how a pop of black can add a graphic punch to any scheme. Here my Mottahedeh chargers and photophores from Howard Slatkin offer that hint. And in working with local florist Flowers and Flowers, I requested anenomes for the same reason. 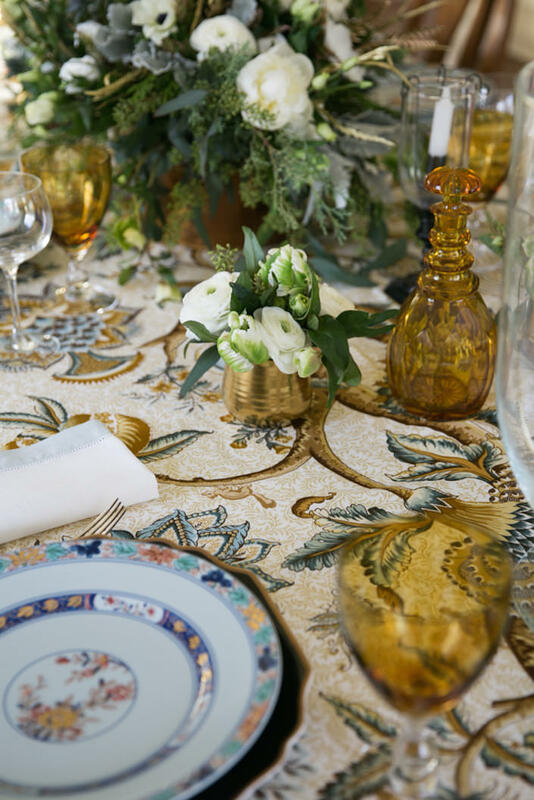 In discussing the centerpiece, I brought in my fabric, expressed wanting a subtle nod to the blue and gold and they did a beautiful job interpreting my request. I love how the blue thistles and gold sprayed grevillea work together adding color and texture. Hoping all of you who celebrate will be at your own Christmas table with friends and family. And wishing you the happiest of holidays with, as always, a grateful note of appreciation for your continuing readership! This entry posted in holiday, interior design. Entry Tags: Braquenie, Christmas, Christmas table, holiday table, interior design, Pierre Frey, Tabletop, Textiles Bookmark the permalink. Merry Christmas. I am certain the company and the repast would equal your sumptuous setting. I would linger a long while in the quality of such a winter wonderland. Beautiful. Merry Christmas! Your table is stunning! It would be an honour to dine at such an exquisite table. Enjoy this very special day. Blessings to you in the New Year! One of my classic prints to use- just call me a copycat! Merry and Happy, Marioops Buatta. Your table looks beautiful! I particularly like the miniature flower arrangements that are so sweet. Your golden colored glassware is lovely and works so well with the overall aesthetic. Happy holidays! Merry Christmas! 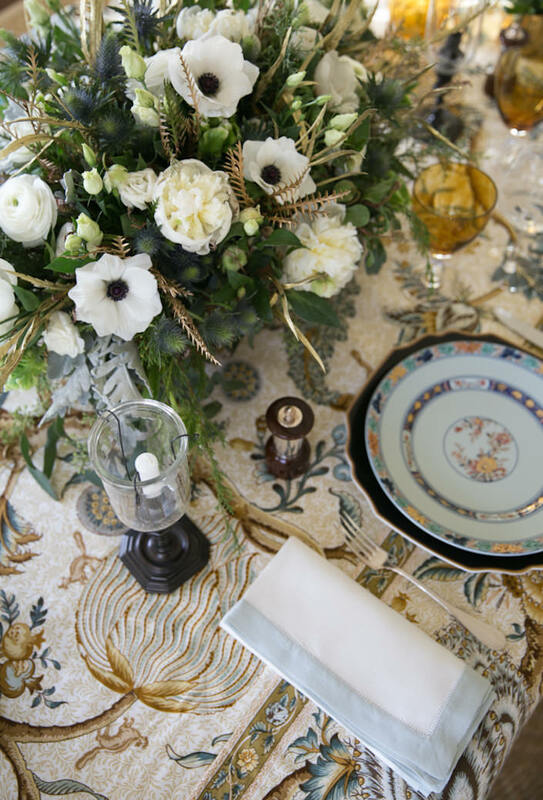 Your holiday table is absolutely beautiful! Thank you for all your marvelous posts all year long. Merry Christmas to you! Best wishes for a great New a Year. Stacey, your table lookis amazing! What great choices you made. Merry Christmas! This is SO classy & beautiful. 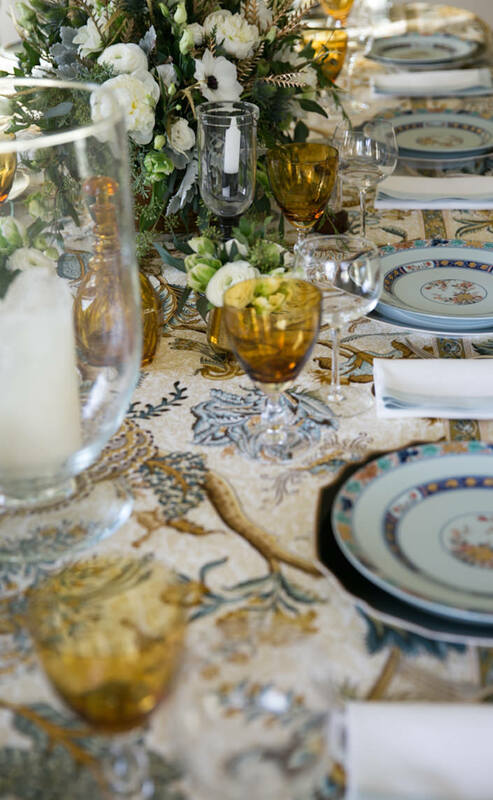 Your tablescape is really a work of art. 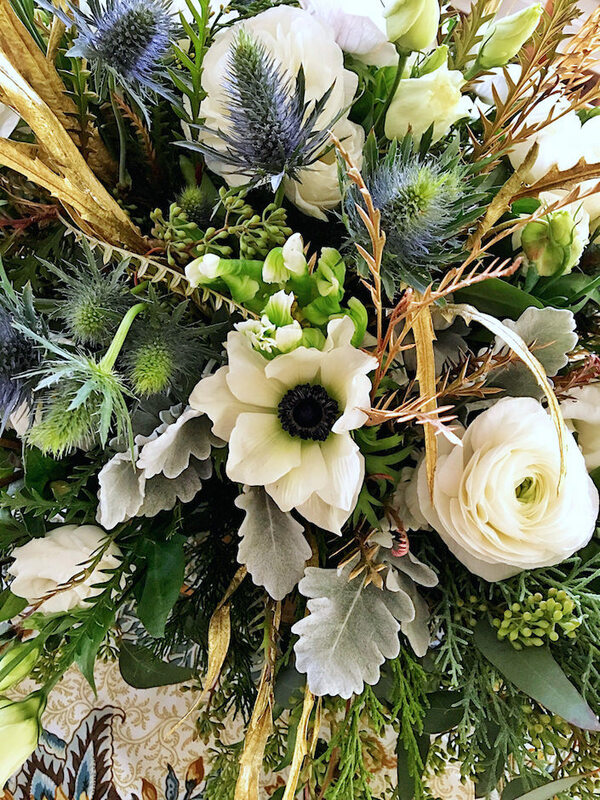 I love your floral centerpiece as well, with the white rannuculus and anemone flowers. Without a doubt the most beautiful table I’ve seen this season. Wishing you all the best in 2017!